The Limited-edition colors Boss DS-1-4a 40th anniversaryâ€”same legendary tone. 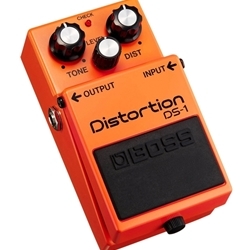 The DS-1 Distortion was introduced in 1978 as part of the updated wave of compact pedal releases. Its hard-edged attack and smooth sustain was an instant success among guitarists, going on to fuel the signature sounds of numerous rock legends. The DS-1 has enjoyed such enduring popularity that’s it’s remained in the lineup to this day, outselling every other BOSS pedal to date. To commemorate 40 years of BOSS pedal innovation, they've released a special version of the DS-1 that features a black body with gold lettering, gold-capped knobs and a vintage silver thumbscrew for the battery compartment. The pedal comes in a special box with the BOSS 40th anniversary logo, and will be available in 2017 only.